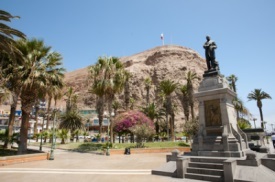 At this lively, historic port, passengers can visit markets or such sites as the Church of San Marcos and El Morro de Arica. Excursions lead to Lake Chungara at an altitude of 14765 feet. It is surrounded by volcanoes and high-country wetlands. Or, view the huge geoglyphs of animals and humans that line the walls of the Azapa Valley, high in the Andean plateau.